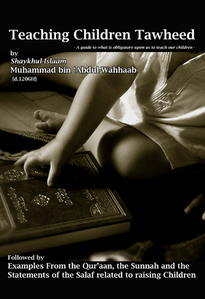 Before the noble reader is the translation of a short but concise treatise by the great imaam and reviver, Shaykhul-Islam Muhammad bin Abdul-Wahhaab – may Allah have mercy upon him – entitled “Teaching Children Tawheed”. The Imaam wrote it in order to direct us to those matters which we must have knowledge of and then teach our children, comprising important fundamentals of the Religion of Islam, written in the form of questions and answers. And for the benefit of the reader, it is followed by “Examples from the Quran, the Sunnah and the Statements of the Salaf related to raising children”, a compilation that illustrates the way of Ahlus-Sunnah in various aspects of child-rearing, from establishing the proper environment in the home and teaching them the correct belief and methodology, to marrying off one’s daughters. Verily among your Wives and your Children there are Enemies for you.